Who is the favorite in Turkey's local elections? 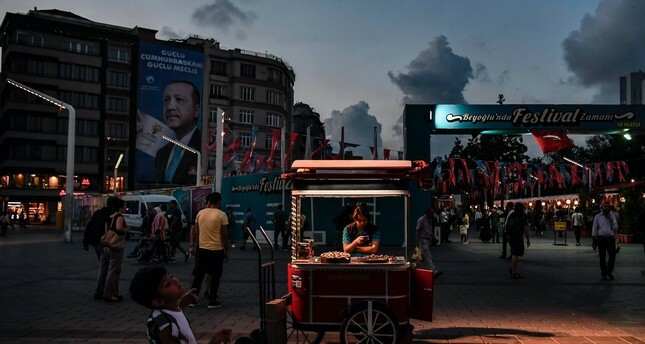 A man sells chestnuts in Taksim Square as a campaign poster for President Recep Tayyip Erdoğan for the June 24, 2018 elections waves in the background, Istanbul, June 18, 2018. Turkey will hold municipal elections next month. March 31 will be a day of many firsts in the country's political history. For example, the ruling Justice and Development Party (AK Party) broke with tradition to run a more environment-friendly campaign. It pledged not to use plastic flags and banners or campaign tools that cause noise pollution. Instead, the movement relies more heavily on social media. Other political parties must have found that decision meaningful, as they followed suit. That was a first in the implementation of campaign strategies. Yet, there are other significant firsts. Having formally transitioned to the presidential system of government in the June 2018 general elections, Turkey will hold its first municipal elections under the new rules. The country's major political parties formed alliances among themselves last year, as the new system required a simple majority to win. Unlike coalitions under parliamentarism, whose shelf life was limited to the coalition government's term, there is a new type of political alliance in Turkey today. Slowly but surely, the country is moving toward a two-party, or two-alliance, system. After two national elections, one of those sides became clearer. Next month, the AK Party will once again join forces with the Nationalist Movement Party (MHP) under the People's Alliance umbrella. The two movements agreed to contest local races together in 30 metropolitan districts. Yet, the partnership could go further. President Recep Tayyip Erdoğan met with MHP Chairman Devlet Bahçeli last week. According to sources familiar with the negotiations, the AK Party and the MHP could work together in most of Turkey's 81 provinces and even contest races with a shared group of candidates. That development will presumably push them closer and mark the beginning of a new political process to consolidate their political power. A quick look at the priorities of the AK Party and the MHP reveals the framework of the People's Alliance. The former is a conservative movement with strong links to the outside world. Consequently, it is able to speak to conservatives and nationalists. The MHP, in turn, rests firmly on a nationalist base. As such, their alliance's target audience consists of conservative-nationalist voters, who comprise some 60 percent of the national electorate. The MHP's brand of nationalism does not prevent the People's Alliance from tapping into the Kurdish vote either. That the AK Party leads polls in eastern and southeastern Turkey, where Kurdish voters constitute the majority, attests to that fact. Even though Turkey's new political system requires two clusters, the People's Alliance still lacks a competitor with a clear platform. Last year, the Republican People's Party (CHP), the Good Party (İP), the Peoples' Democratic Party (HDP) and the Felicity Party (SP) formed the Nation's Alliance. Yet, the various parts of that alliance subscribe to contradictory political ideologies. The CHP, the IP and the SP appeal to Kemalist, nationalist and Islamist-conservative voters respectively. The HDP, in turn, has organic ties to the PKK terrorist organization. Their ideological inconsistency limits the Nation's Alliance political goal to removing the AK Party from power. To make matters worse, that partnership fuels tension within each party's own base. Hence a recent announcement by the CHP, the driving force behind the Nation's Alliance, that it was partnering up with the İP alone – and in a limited number of provinces and districts. Yet, a source with close ties to the intelligence community claims that the PKK's senior leadership instructed the HDP to support the CHP-İP alliance nearly two months ago. In other words, the HDP threw its weight behind the alliance indirectly by not contesting races in certain metropolitan districts. That decision did not sit well with many İP leaders who stepped down in recent weeks. The İP base reportedly feels the same way. The opposition's failure to form a clear-cut and transparent alliance to challenge the People's Alliance, coupled with the concealment of partnerships, the ideological incoherence of the various opposition parties and their short-term and limited goals, prevents the rise of the second major force in Turkish politics. That suggests that the People's Alliance is the favorite to win the March 2019 municipal elections.